Cyclic Steam Simulation (CSS) – uses a single vertical well and the injection of steam to recover bitumen. Toe to Heel Air Injection (THAI) – involves igniting air and injecting it into a vertical well to melt bitumen and recover it. 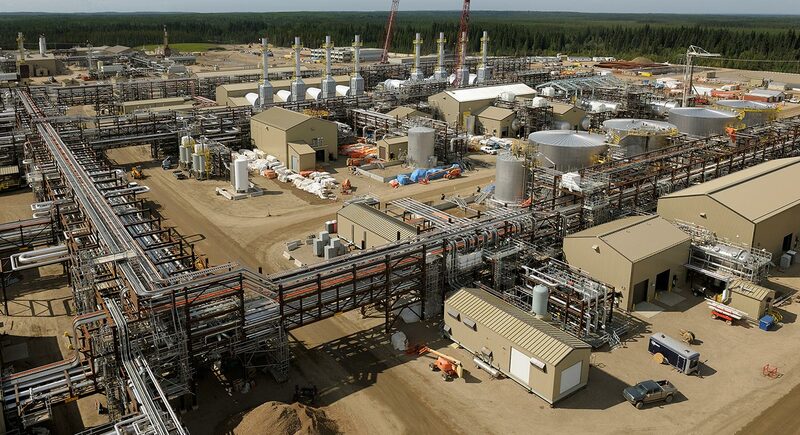 Vapour Extraction Process (VAPEX) - uses solvents to increase the viscosity of oil sands for recovery. SAGD was invented in 1978. SAGD works by drilling two horizontal wells beneath the surface, parallel to each other, about four to six meters apart. The top well is injected with steam that heats the surrounding bitumen, reducing its viscosity. This is the Steam Assisted (SA) part of the name. The less-viscous bitumen then drains into the bottom well with the help of gravity and is pumped to the surface. This is the Gravity Drainage (GD) part of the name. The produced bitumen is mixed with hydrocarbons to further reduce its viscosity and is then stored in storage tanks for transportation and further processing About Alberta's Oil Sands. (2014, January 1). Total E&P Canada -. Retrieved April 20, 2014, from http://www.total-ep-canada.com/upstream/about_oilsands.asp About Alberta's Oil Sands. (2014, January 1). Total E&P Canada -. Retrieved April 20, 2014, from http://www.total-ep-canada.com/upstream/about_oilsands.asp About Alberta's Oil Sands. (2014, January 1). Total E&P Canada -. Retrieved April 20, 2014, from http://www.total-ep-canada.com/upstream/about_oilsands.asp About Alberta's Oil Sands. (2014, January 1). Total E&P Canada -. Retrieved April 20, 2014, from http://www.total-ep-canada.com/upstream/about_oilsands.asp . SAGD has several advantages over oil sands mining. SAGD production has less land disturbance and does not result in the creation of tailings ponds. However, SAGD requires large amounts of thermal energy to produce steam. Currently the vast majority of this energy is provided by natural gas, a non-renewable and hydrocarbon fuel source, making greenhouse gas emissions a key concern GO Productivity "Lessons Learned from Execution of Oil Sand's SAGD Projects" (2014) http://goproductivity.ca/ GO Productivity "Lessons Learned from Execution of Oil Sand's SAGD Projects" (2014) http://goproductivity.ca/ GO Productivity "Lessons Learned from Execution of Oil Sand's SAGD Projects" (2014) http://goproductivity.ca/ GO Productivity "Lessons Learned from Execution of Oil Sand's SAGD Projects" (2014) http://goproductivity.ca/ . In addition, water use is another important concern. The SAGD process requires a significant amount of water, although 80 to 95 percent of the water used is recycled back into the process. Some SAGD operations also use saline water that is determined to be unsuitable for drinking or irrigation purposes in order to minimize the use of fresh water Using Undrinkable Saline Water in SAGD. Retrieved April 20, 2014, from http://www.capp.ca/energySupply/innovationStories/Water/Pages/usingUndrinkableWater.aspx Using Undrinkable Saline Water in SAGD. Retrieved April 20, 2014, from http://www.capp.ca/energySupply/innovationStories/Water/Pages/usingUndrinkableWater.aspx Using Undrinkable Saline Water in SAGD. Retrieved April 20, 2014, from http://www.capp.ca/energySupply/innovationStories/Water/Pages/usingUndrinkableWater.aspx Using Undrinkable Saline Water in SAGD. Retrieved April 20, 2014, from http://www.capp.ca/energySupply/innovationStories/Water/Pages/usingUndrinkableWater.aspx . Mining refers to the oil sands extraction process whereby large amounts of earth are removed, mixed with water and transported by pipeline to a plant, where the bitumen is separated.